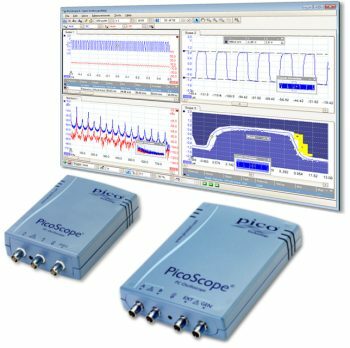 With the PicoScope 2200 range of entry–level USB oscilloscopes you get an oscilloscope, spectrum analyzer and arbitrary waveform generator all in one powerful and affordable device. These compact, inexpensive oscilloscopes have all the power you need for your application, whether it’s design, research, test, education, service or repair. They are available with bandwidths from 10 MHz to 200 MHz and offer the features and performance of scopes that are several times their size — and their price. Invaluable tools for simple automotive diagnostics and logging. 4424 product is useful for high data rate recording and extra channels. For electronic projects without high frequencies, and for students/pupils the 2203 is a very useful device. The 2 channel oszi and the signal generator are a cheap and easy entrance into a testing environment for electric circuts. The powerful software is the same as for the bigger oszis, and it's fun to use. What an amazing bit of kit! I’ve used standard bench top oscilloscopes in the past, but never anything like this. What is most impressive is the simplicity of the software - I was able to get up and running right away without so much as glancing at the instructions due to how intuitive the interface is. The other thing that’s particularly impressive is the options available to capture the waveforms your looking at. Its easy to output as an image for a before and after comparison (I’m using it to analyse switch signals and filter them for use with a logic system). You can also output the waveforms as a text file and then feed it into the AWG and output the waveform to the circuit to test stability. After working with this I don’t think I could go back to a standard bench top scope, simply brilliant! I purchased the most inexpensive 2-channel scope for electronics debugging and in a few weeks it has made a huge difference in my hobby. Robust design, good features and amazing software. You definitely get your money's worth and then some. And it even understands I2C and other serial protocols! Just powered this up. Install is easy and the interface is pretty intuitive. I really like the AWG. Lots of power compared to a regular scope. For a first pass, everything works and I'm impressed with the form factor. Will review again in a month. The addition of an AWG is very useful and now I don't have to use a seperate signal generator unless I want an isolated signal (I assume the ground is common across chan A/B & AWG). The software is fairly universal across all ranges which makes even the 'lowest' scope in their range a very powerful tool. Being able to use the datalogger with this is also a bonus - I can log slow data without needing a different device (for example, testing a battery charge / discharge cycle). My only irk is that many 'buttons' do not appear to have equvalent drop-down menu items. Most software I've used has every setting or configurable item under a menu option somewhere, even if they are inactive. This is especially important for options that are rarely used - it allows me to 'search' for what I need by working through the drop down menus. It also means I can just use the keyboard, which can be easier and quicker than the mouse. If you're in a tight spot ballancing a laptop on one knee while tring to hold a probe on a wire, moving a mouse just gets impractical. For example, probe settings are only under the probe icon - there is no menu item for this. Likewise for the AWG: have to use the icon. But, all-in-all a brilliant piece of kit and highly recommended for all workshops.